This hydrogen fuel cell powered, gyroscopically balanced, one-wheeled recreational and commuting vehicle provides an extraordinary vision of the kind of personal transport we could be using 20 years from now. The design brief for Bombadier EMBRIO Concept was to “create highly innovative, functional and exciting products to exceed people’s recreational needs” and find the “next thing” in recreational vehicles. 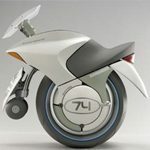 The result is a futuristic and minimalistic one-wheeler that is as about far away as you can get from the conventional image of a uni-cycle – a mode of transport normally associated with circuses and street parades. The riding position will be similar to a motorcycle with a complex series of sensors and gyroscopes balancing passengers on the single wheel. The rider activates a trigger on the left handlebar to accelerate and turns are made by shifting body-weight rather than actually steering. Sweet. I’d ride one. Very “Minority Report”. Share the post "Say… That’s a Nice Bike…"